From time to time there are discussions about relations between the stock market capitalization (CAP) and gross domestic product (GDP) of countries around the world and of how those relations may influence investment decisions. The latest one I can find on this board is https://www.bogleheads.org/forum/viewt ... p?t=247165. I became curious and searched for graphs of CAP vs GDP. I could not find what I wanted. Possibly because Warren Buffett popularized the ratio of CAP/GDP as a measure of market valuation, I could easily find time-series graphs of CAP/GDP for various countries, e.g. for the US, or a bar chart of CAP/GDP at one point in time for 64 countries, but not the graph of CAP vs GDP that I wanted to see. However, as the World Bank provides both data sets, I could make the graph I wanted, which is below. There are a couple of curiosities that might be of some general interest. The figure is a snapshot in time at the end of 2017. Data for each of 218 countries, plotted as disks, is from the World Bank. Plotted horizontally is each country's fraction of world gross product (GDP); plotted vertically on a log scale is each country's fraction of world stock market capitalization (CAP). World product is the sum of all countries' GDPs, and total capitalization is, similarly, the sum of all countries' stock market capitalizations; both given by the World Bank in US$. 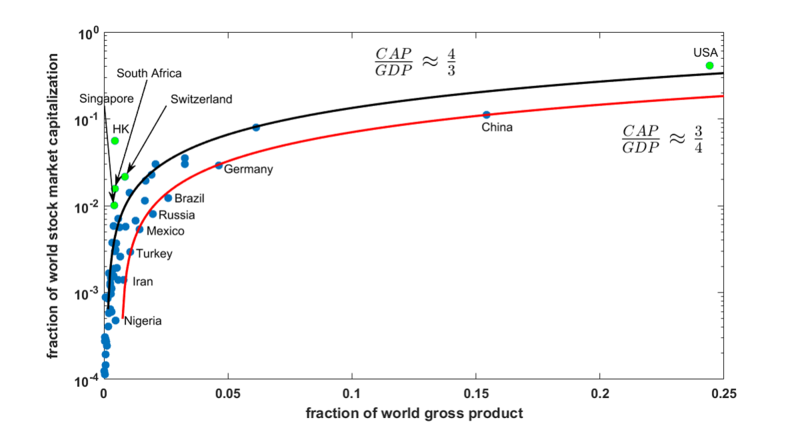 (The world ratio of CAP/GDP = 0.98.) Note that the vertical axis is on a log scale and that CAP uses total market capitalization, not the free-float capitalization of stock market indices and index funds. Countries without data or without public stock markets are below the bottom of the scale. As the lowest country allocation in Vanguard's total world fund is a bit lower than 0.1%, countries much below 10-3 of CAP on the graph are frontier markets. The black line is a single parameter linear fit to all the data. The line looks curved because of the log scale of the vertical axis. The slope of the line is close to 4/3 with an R2 = 0.87. The R2 is deceptively large because the scatter is larger for the 50 or so countries large enough to matter that actually appear in the figure. Nonetheless, the bulk of countries, including the US, fall reasonably close to the 4/3 line. It's the most marked departures from the 4/3 line, however, that seem curious. The four green dots represent Singapore, Hong Kong (HK), South Africa, and Switzerland. These four countries have exceptionally large CAP/GDP ratios, all above 2.4---the next largest is the US at 1.65---with Hong Kong at almost 13. Why do those countries have such large capital markets relative to their economy's size? At the end of 2017 were these four the most overvalued stock markets of the world? Those versed in economic theory and history may have reasonable answers, I do not. It is also plausible that each case comes from historic idosyncrasies, with no common explanation. Also curious are the group of eight countries labeled in the figure that have a systematically small domestic capital market relative to their economy size. The red line is a single parameter linear fit through only the eight labeled countries. The fit is better than the black line, with a slope of 3/4, some 44% less than that of the entire data set. Except for Germany, all these countries are developing. Some of the eight would score poorly on measures of economic and political freedom, but others of the eight would not. At the end of 2017 were these eight the most undervalued stock markets of the world? Or, do they have particularly strong structural or cultural biases against the formation of domestic public joint stock companies? I neither draw conclusions, nor make conjectures. Probably no firm conclusions are possible from a snapshot in time. As the World Bank says they have these data sets going back 50 years, it might be an interesting research project to plot how the correlation of CAP and GDP has evolved through part of the modern era. Cool chart, thanks for sharing your work. Will the US mean revert to be more in line with the rest of the world? Is China's stock market poised to explode to better reflect their share of world GDP? Do I need to monitor this data for changes over time to see if my investment plan requires adjustment? Is it finally time to add international if the US crosses below that black line? All questions that a total world stock investor need not concern themselves with. I don't particularly care if the US loses $10 trillion in market capitalization over the next several years, while China, Germany, and Japan collectively gain $10 trillion. The net effect on my portfolio is zero. All that I need to care about is that the market capitalization of the entire world of publicly traded equities increases over time. And since I have no control over that, I really don't need to care about it at all. As the World Bank says they have these data sets going back 50 years, it might be an interesting research project to plot how the correlation of CAP and GDP has evolved through part of the modern era. Historically, my sense is that developed countries have been much more highly “equitized” than emerging countries. Their equity markets have been around much longer, and have played a greater role in providing a source of finance for economic activity. Thus these countries have had higher ratios of market capitalization to GDP and have dominated the cap-weighted indexes accordingly. For emerging economies, market cap/GDP ratios have historically been lower as companies have relied more on other sources of financing like bank loans, government financing, and retained earnings. That said, emerging countries today are quickly becoming more "equitized," relying more heavily on the sale of stock shares to finance their rapid economic growth. So one might expect their market cap/GDP ratios to be rising. Last edited by SimpleGift on Mon Apr 15, 2019 9:45 am, edited 1 time in total. Thanks! That's very interesting. One common discussion point in the US vs. the World threads is how much of certain countries economies are available on the capital markets (e.g. China vs. the US). It is helpful to have data on this to look at. Regarding Hong Kong, a question/speculation which comes to mind is the large number of mainland Chinese companies which list on the Hong Kong market. Do these count towards CAP but not GDP in these figures? Historically, my sense is that developed countries have been much more highly “equitized” than emerging countries. Their equity markets have been around much longer, and have played a greater role in providing a source of finance for economic activity. This seems like a perfect excuse for me to bring up an old (1997) paper "Re-Emerging Markets" (whose general theme is that many emerging markets actually "emerged", then submerged, and then have re-emerged in recent decades). 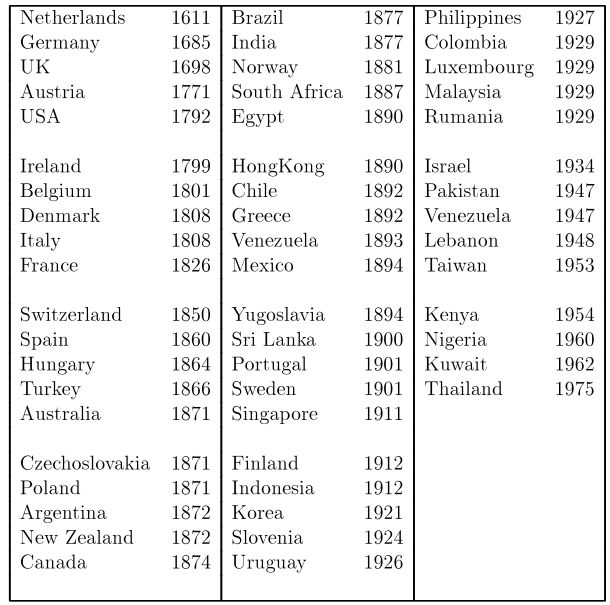 China, Malaysia, India, Egypt, Poland, Romania, Czechoslovakia, Columbia, Uruguay, Chile, Venezuela, and Mexico all had active equity markets in the 1920s. Many of these markets were large enough to attract foreign investors as well as significant enough to have share prices reported in international publications. Of the forty markets that were founded before the twentieth century, only two, the US and the UK markets have been extensively analysed over long investment horizons [ed: this was true when written in 1997 but has changed somewhat in the past 2 decades]. Table 1 tells us that most of today's stock exchanges have long histories. And here's the table of when stock exchanges were actually founded. Why do those countries have such large capital markets relative to their economy's size? Giving this question more thought, two of your above-average countries (green dots) clearly have idiosyncratic histories to explain their high market cap/GDP ratios today: the Hong Kong stock market includes China H-shares (companies incorporated in mainland China but traded in Hong Kong), and Switzerland, as a traditional financial safe haven in Europe, has a 300-year history of private banking, neutrality, sound economic policies, low inflation and a strong currency — plus several giant pharmaceutical companies today. Your remaining green dot countries were all British colonies at one time, I believe — South Africa, Singapore and the United States. Accordingly, each adopted English-style common law legal systems with very strong protections for shareholders' rights — including protections against appropriation by insiders, protections for creditors and traditionally strong enforcement of their commercial laws. This may have contributed to the higher value of their securities and their broader capital markets today.